[View though the central arch of a bridge over a canal, Sonargaon?]. bl.uk > Online Gallery Home	> Online exhibitions	> Asia, Pacific and Africa Collections	> [View though the central arch of a bridge over a canal, Sonargaon?]. 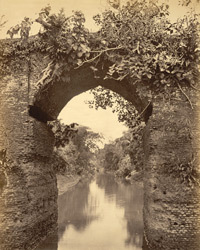 Photograph of a view through the central arch of a bridge over a canal in Sonargaon. This print from the Temple Collection was taken by an unknown photographer in the 1870s. Sonargaon is situated in the Dhaka District, Bangladesh near the banks of the Meghna, 15 miles east of Dacca. It was the ancient Muhammadan capital of Eastern Bengal. However, only the ruins of the ancient city of Sonargaon remain; the area is buried in a dense jungle of bamboos and other trees. Waterways were traditionally the most important means of communication in Dacca and when the rivers rise, the whole of the lower part of the district floods and boats were practically the only means of transport for men and goods.